Jory Fleming, 22, has autism, which makes social interaction difficult. “I didn’t really expect to do much of anything,” he said. He could not have been more wrong. Fleming recently won one of academia’s most prestigious awards, the $68,000-a-year Rhodes Scholarship, for students who succeed inside and outside of the classroom. 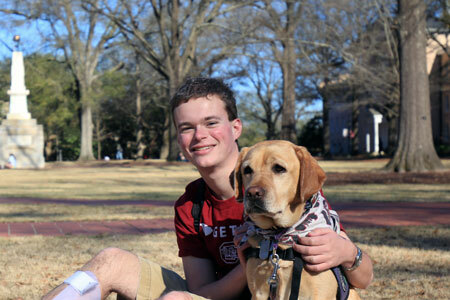 With the help of a service dog named Daisy, the Columbia resident has thrived at USC. Now, Fleming is preparing for his next adventure, two years studying at Oxford University in England, starting next October. Trained and donated to Fleming by the local non-profit Palmetto Animal Assisted Life Services, Daisy can alert him when his medical feeding pump - necessary because of a genetic condition - is not working correctly. She helps him stand or pick things up when he is tired. And she knows to apply pressure to certain pressure points on Fleming’s body when he is stressed. But Daisy also helps out in social environments. It turns out having an adorable dog always at your side is a great icebreaker. “I certainly get a lot of attention as a result of having Daisy and have met people I otherwise wouldn’t have,” Fleming said with a laugh. With Daisy at his side, Fleming has bloomed into the prototypical Rhodes Scholar. Each year, 95 winners from around the world, including 32 from the United States, are chosen for their academic records, leadership skills and public service efforts. Past winners include former President Bill Clinton, astronomer Edwin Hubble and ABC News anchor George Stephanopoulos. Fleming is USC’s 10th Rhodes Scholar since the program began in 1904 and its first since 2000. Fleming attends USC’s sporting events and volunteers with Cocky’s Reading Express, taking trips to elementary schools to read to children. He also coordinates education outreach for USC’s Students Engaged in Aquatic Sciences organization, teaching kids in schools about marine science. In addition, Fleming helped form the Cocky’s Canine PAALS group at USC, which raises money and coordinates volunteers to support the nonprofit that donated Daisy. Professors say he is quick to help other students struggling with difficult programs or concepts. With Daisy at his side, he has picked up a lot of friends along the way. Fleming says he now is ready for a new adventure at Oxford, one of the world’s best schools. Though he has never travelled outside of the United States, Fleming is moving to England next year and plans to pursue a master’s degree in geography. And Daisy will be right there with him. This young man is a bonafide role model. Too often folks reflect on their college experience with some semblance of regret over not taking the proverbial bull by the horns and all the opportunities afforded them while in school. Pay attention to this student's outstanding example. Along these lines UNIVERSITY MURANGA they admire the school curators to assume a more proactive job.